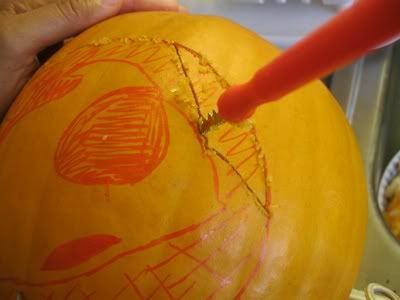 how to carve a pumpkin in 10 easy steps! 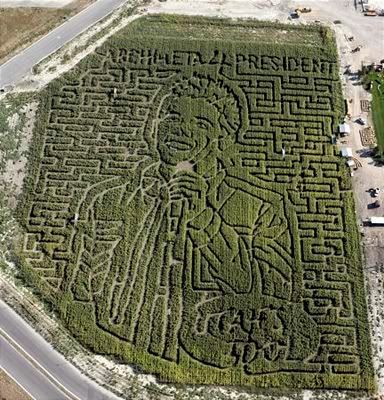 This blog is dedicated to Becky May and her cute lil nephews, as she specifically requested a pumpkin-carving blog since Halloween is not as big of a deal in Australia as it is here. Happy pumpkin carving! Things you’ll need: a pumpkin, pencil & paper, scissors, Sharpie, pumpkin carving knife, spatula, nail polish remover, candle, and some 1980′s nostalgia. step 2: pick a sweet design. 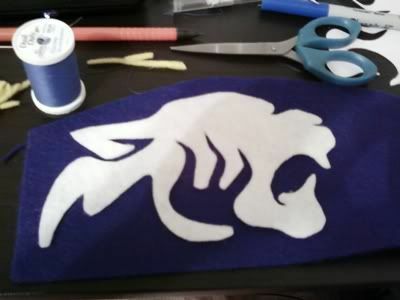 Everyone keeps guessing I’m going to be a Thundercat for Halloween. 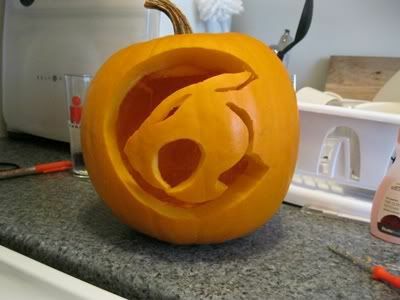 I’m not, but it inspired me to make a Thundercats Jack-o-lantern. remember back in Kindergarten when you learned to do a tracing. 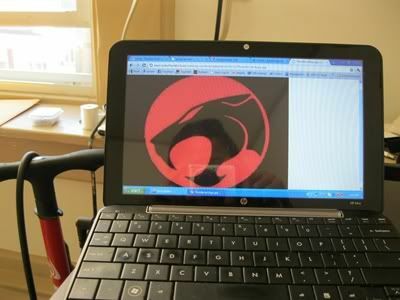 You can do a Google image search for whatever design you want, then use your laptop like a shadowbox to trace the design. 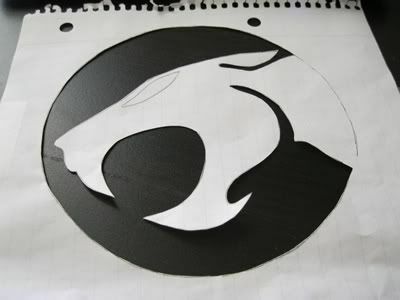 make a stencil. Cut along the lines nicely now. 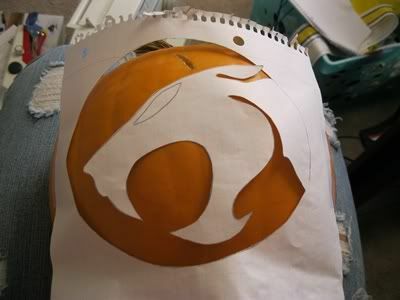 Then you have a stencil, and you Sharpie the design onto your pumpkin. 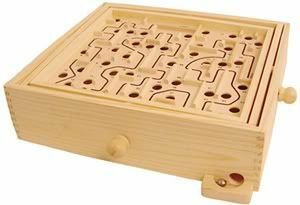 all kinds of grade school skills you thought you'd never use again! Make sure you pick the nicer side of the pumpkin as your “face.” Unless you are going for the teenage acne look. this is the back of his head. ugly, isn't it? step 3: carefully cut the top off. Cut at an angle, with a little wedge, so it doesn’t fall in. 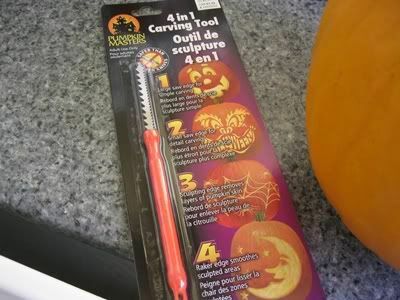 It is highly recommended to use one of these special pumpkin knives (you can get them at the dollar store or anywhere around this time of year, really), so you don’t accidentally cut off your finger. special little pumpkin knife so you don't lose a finger or two. If you do happen to cut off your finger, wrap the appendage in a ziploc baggie before putting it on ice, so that it won’t get frostbite before the emergency room doctors can reattach it. I am serious. (Ha, and you thought I wasn’t using the MSPO or the CPO behind my name.) If you don’t believe me, I can recommend a good prosthetist if you need a partial hand prosthesis. 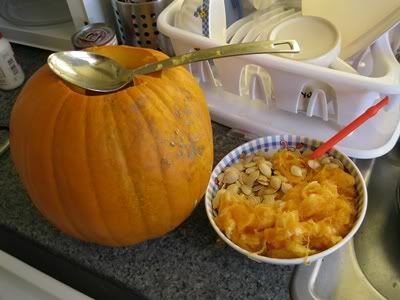 Step 4: De-gut the pumpkin. mmmm what do we have in here? Ok, this is the gross part. 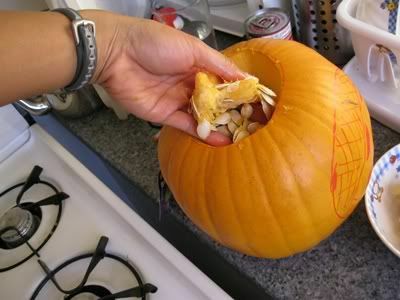 You gotta stick your hand inside and get all the pumpkin guts out. It’s kind of like reaching inside a turkey or chicken. This is why I only ever buy boneless chicken breasts at the supermarket. 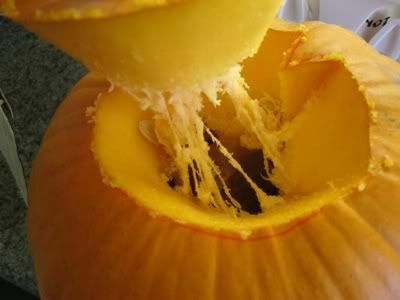 who knew a pumpkin had so much guts? 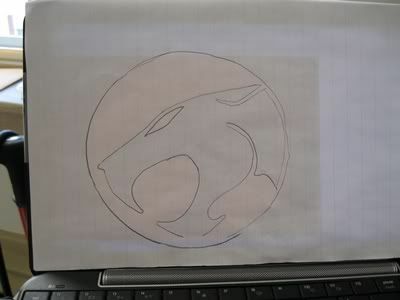 Step 5: Carefully carve your design. Just follow the stencil. BE CAREFUL NOT TO LOSE A FINGER!!! 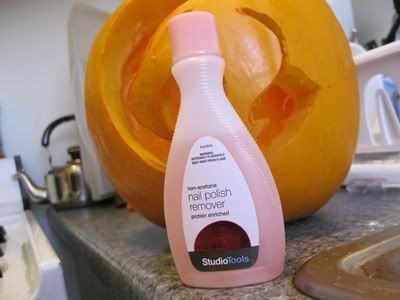 Step 6: If there is Sharpie marking leftover on the pumpkin, use nail polish remover to take it off. yes, nail polish remover takes off Sharpie. The stuff with real acetone in it is the best. But I suppose, toxic. Try not to inhale it to get high. looks pretty cool huh? but not finished without a candle! Step 7: Choose the proper candle. why don't pumpkins smell like pumpkin pie??? The best candles to use are the nice scented ones that come in a glass candle holder already. This way you won’t burn the house down. Plus, raw pumpkins smell nothing like pumpkin pie or spiced pumpkin lattes, which confuses me to no end. 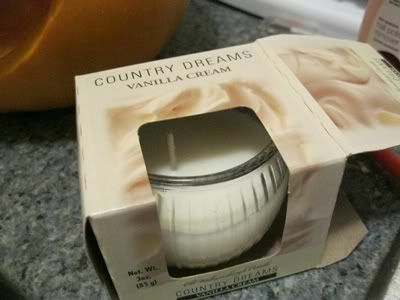 I wanted to get a pumpkin pie-scented candle but for 99 cents had to settle for the vanilla cream one. 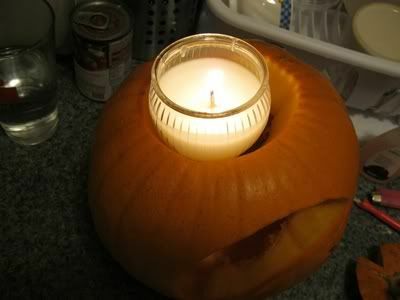 Step 8: Curse a little… because the top you cut in the pumpkin was slightly smaller than the candle you bought. Step 9: Shove the candle in anyway. 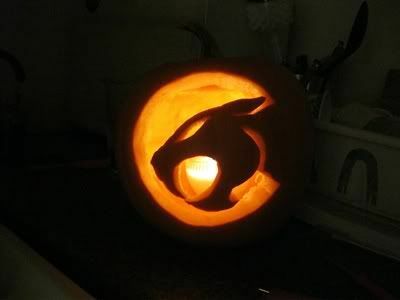 Step 10: Admire your mad pumpkin carving skills while singing the theme song to Thundercats. 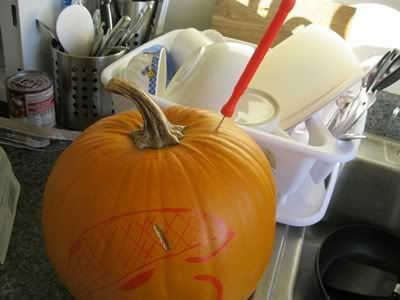 And that’s how to carve a pumpkin, Wongstar-style. Harry Potter + Twilight + The Simpsons! Whoa, so I was just watching TV when I saw the preview for next weekend’s Simpsons Halloween special. They are doing a spoof on Twilight where Lisa falls in love with a vampire named Edmund…who is voiced by Daniel Radcliffe. 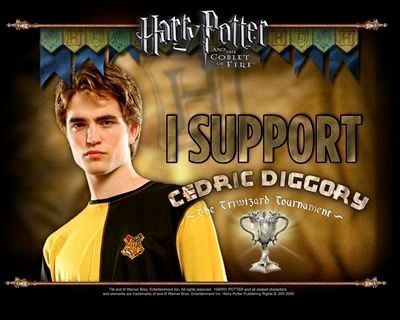 YES, the guy who plays Harry Potter is doing a parody of Edward Cullen. On The Simpsons. Not sure it can get any better than that!!! First step: pick the perfect pumpkin. 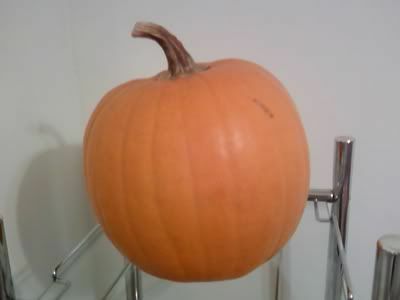 What do you look for in a pumpkin? Some just look for darn good looks like size and lack of blemishes, spherical-ness. You can also knock on it like a watermelon. I like to make sure mine smells nice, has good life ambitions, self-confidence, and an excellent command of grammar. An appreciation of bad puns is a bonus. There is definitely a minimum height requirement though. Here is the one I picked! 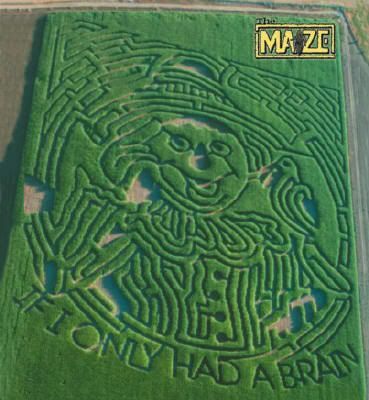 Things to do in Delaware, #5: go to a corn maze. 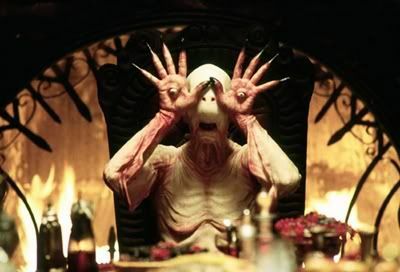 this scary bad boy was the best part of the movie! no worries, the Wongstar has a brain. 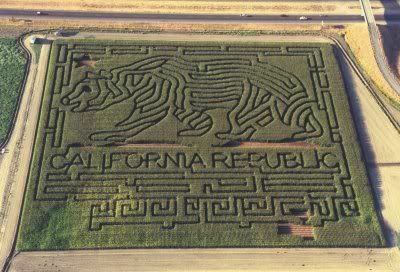 I'll always be a California girl at heart. Go Giants! 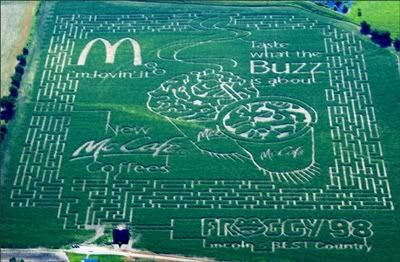 Well, we went to a little farm here and the maze wasn’t as spectacularly intricate as some of those depicted above, where you can end up completely lost. It was a good idea to start small, in case we found out we hated each others’ guts, we wouldn’t be stuck together for hours upon end. Or worse, get separated and then stranded as he was the one that drove us there. Wow, that would be a pretty bad date! 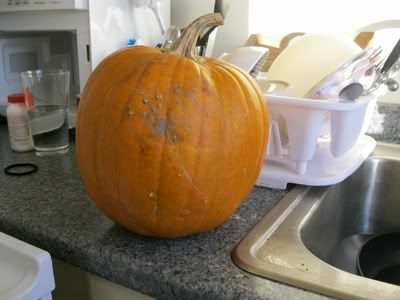 Next up sometime this week is how to pick and carve a pumpkin, per Becky May’s request. My mom’s middle name is Mary. Unlike us kids and my dad’s side of the family, she doesn’t have a Chinese middle name. Everyone on Mom’s side of the family has a Catholic middle name. Funny that. Mom likes when I mention her in blogs. 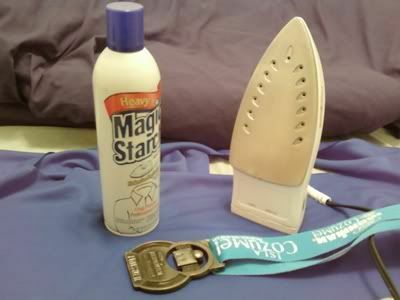 I like to iron my finisher's medals. ...Not! A swim story and a swim update. Funshine Bear was my favorite. I didn’t learn to swim as a kid. When I was 3 or 4 and my big sister was 5 or 6, we went to a day care center. There was a swimming pool there and I think once a week we kids were allowed to play in the pool. The first few times, my mom wouldn’t let us join in on the fun. We begged and begged; all the other kids looked like they were having a blast and so finally she relented and sent us to day care one day with towels. I had my Care Bears swimsuit and Nat had her Strawberry Shortcake one. 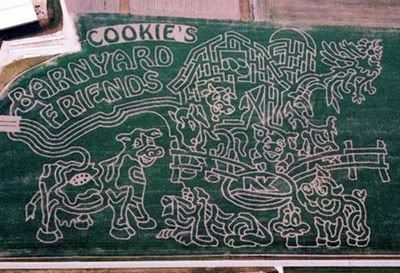 Now this is what I very clearly remember 25 years later: all the other kids had really fun beach towels with their favorite cartoons on them. Care Bears, She-Ra and He-Man, Transformers, Rainbow Brite, Thundercats and My Little Ponies. Well despite living so close to the beach growing up, we never went to the beach because I grew up thinking Asian people didn’t go to the beach. Because at the beach, you get dirty. And Asian people don’t get dirty. This is also why Asian people don’t go camping. What what towel did I have? A boring white towel that probably had “Brookside Hospital” stamped on the end (this was the hospital I was born in and apparently I came home with extra white towels). See, traumatized from swimming at such an early age already. All I remember next was we got in the water and I just stood there bawling. My mom never made us go swimming again. 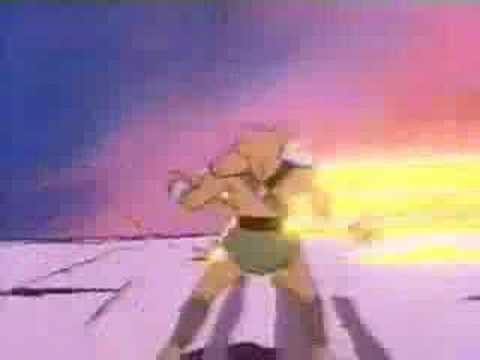 Wilykit was my favorite Thundercat. 15 years later, I saw my first Ironman when I was 18 years old and decided I had to learn how to swim. I had to make the 2hr20min cut-off so I could be an Ironman too. Now fast forward another 10 years later and while some may say I still don’t know how to swim, my brother and sister still haven’t learned how to swim at all. Anyway, I have been making good progress these last few weeks since I decided that there is a real swimmer inside of me that is ready to come out. I think secretly I had still been harboring a childhood fear of drowning, and when you swim really really really hard like you are supposed to, breathing is difficult and then I feel like I might drown. Well Coach gave me two options: drown or get faster. 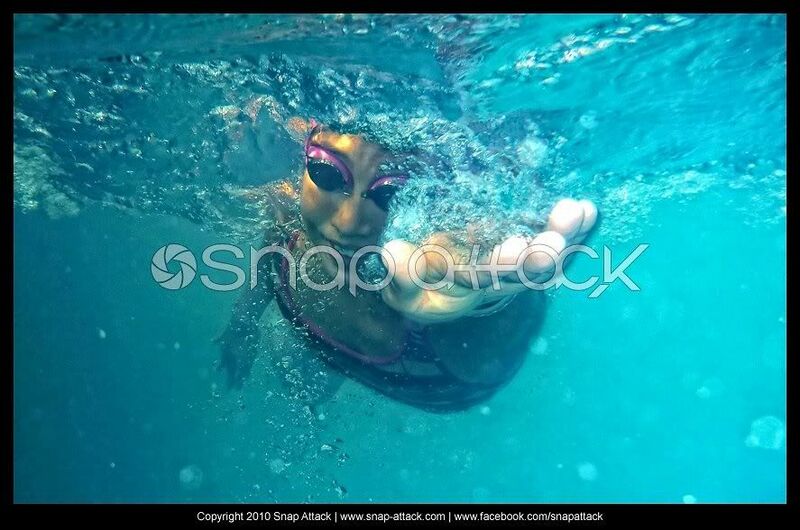 insanely awesome swim pic of the Wongstar from Snap-Attack! So I have been chasing Zeke and Mike at Mac’s swimming pool three times a week since August and finally this week they can’t drop me any more! I am “mighty chuffed” as my friend The Bean would say and even have to tell the guys to stop slowing down. They say maybe they are not getting slower, maybe I am just getting faster. I hope so. I can’t really tell. Apparently every time she followed me on ironmanlive.com and saw my bad swim times, she would say to herself “It’s because the poor girl has no arm muscles. Her arms are getting too tired.” Oh, moms know best. Ok, maybe she didn’t know best when I was 3 or 4 when she should’ve just said “stop crying and take swim lessons,” but she has since learned. Better late than never. Before I pick what outfit to strut my stuff in for the Punkin Chunkin Pageant, first I’m assembling my super awesome Halloween costume. prize to who guesses what my costume will be! It’s no secret that I come from a bloodline of MacGyver‘s. Momma Wongstar sewed all our costumes when we were young (and still does for my big sis) and Papa Wongstar is an engineer. I’m no stranger to the sewing machine (and it’s actually one of the job requirements as a prosthetist-orthotist, for real) so here goes nothing. It’s inspired by a TV show (did you expect anything less from a TV writer?) and is gonna be really freakin’ fantastic (did you expect anything less from the Wongstar?). So who knew? 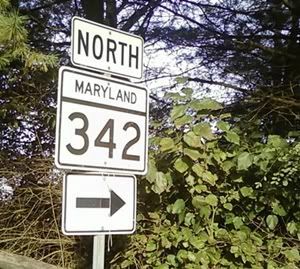 Every year the first state of Delaware hosts a world championships. For catapulting pumpkins. It’s called the World Championship Punkin Chunkin and it’s the same weekend as Ironman Florida. Since I will not be racing IMFL after all, and it’s only a 90-minute drive away, and Discovery Channel is doing a documentary of this 25th anniversary of the Punkin Chunkin (it will be broadcast on my birthday, which is on Thanksgiving this year)…well, yours truly has been recruited to help cover the event as a writer for MSN TV. The best part is that there is a Miss Punkin Chunkin Pageant. And… I AM TOTALLY ENTERING. I mean, I’m gonna be there any way, would you really expect anything else? Sadly there is no swimsuit competition. Nevertheless, the tiara will be mine. Today I joined the YMCA in Delaware. I am not above applying for financial assistance and based on the amount of money I made last year, I only have to pay a whopping $15 per month which gets me into every Y in the entire first state (oh yeah, that’s all seven of them) including the five or six swimming pools within an 8-mile radius. Score! See, sometimes it pays to not get paid much. Did you know that the C in "YMCA" stands for Christian? You are currently browsing the Jocelyn Wong's Blog blog archives for October, 2010.